What is a spiritual development circle? A spiritual development circle consists of 6-8 participants whose collective aim is to develop themselves mentally, emotionally and spiritually. The circle last for about 2 hours depending in time commitments and follows a format that includes a variety of different skills to be practiced and developed. To prevent the circle practice from becoming boring, the skills practice is rotated each week. The circle format is divided into two key areas, which are ‘personal development’ and ‘spiritual development’. Personal development includes developing the ability to think and reason, as well as developing greater emotional understanding. Spiritual development includes understanding our nature as a human soul and that relationship with the wider universal force that is called ‘God’. The circle format allows like-minded individuals to come together to share a sense of unity and to develop their potential as true spiritual beings. Taking part in a circle is not always easy because where there are people there is the potential for differences of opinion. The circle format provides a good foundation to teach non-judgement and tolerance. Circle participants can also learn more about themselves, which can lead to a greater sense of personal happiness and compassion towards others. 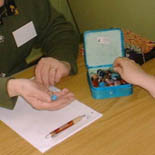 The circle format has been created in such a way that allows each participant to develop in a way that suits his or her level of understanding. Each practice within the format allows the participant to experience balance in the areas of personal development and spiritual development. It is important to include that spiritual development is a very personal process and is not about being better than anyone else. Below is a basic outline and description of the circle format. We also have the circle format to download as a PDF. Prayer: A prayer is often said at the start of a circle as an expression of gratitude and thanks for our life experience or as a point of sharing our gratitude for the well being of others. The prayers in general can be about anything and anyone. Meditation: Meditation is a vital part of the circle because it teaches us how to still our mind and relax our bodies. The benefits of developing a still mind and relaxed body are many. Utilizing the benefits of meditation also teaches the art of focusing our mind so that we may develop our spiritual communication. The Book: Each week the circle participant reads one of the writings from the book, “The light in your life is spirit”. They are then asked to write down their thoughts and feelings about that writing. This aspect of the circle helps to stimulate the participant’s ability to think as well as teaching a broader view of humanity and spirituality. Spiritual card Reading: Practicing cards is another essential aspect of the development circle because it helps the participant develop their communication with their spiritual guide. Reading cards is a unique experience for each circle participant card reading styles will vary, although the spiritual message will come from the spirit guide. Spiritual healing: Spiritual healing or hand on healing is the age-old art of channelling healing energy through one person to another. To develop hand on healing the circle participants learn to clear their mind and ask for healing energy to be given to the recipient. 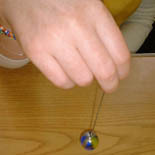 Pendulum: The pendulum is a divining tool that has been used for centauries. In the circle format the participants learn to use the pendulum to help them communicate with their spirit guide in the form of asking questions. 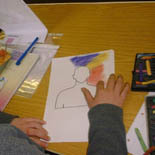 Aura reading: To read auras the participants will need an aura outline and some coloured pencils. This practice is about clearing the mind to sense or even see an individual’s aura. The outline is coloured in and then interpreted in turn. Each colour has a meaning and the participants can learn about these meanings.